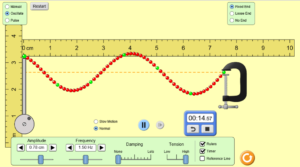 PhET simulations are interactive simulations of science and math concepts created by the University of Colorado Boulder. Students are able to run these simulations, manipulating different aspects of a construct to understand science and mathematics concepts. Depending on the simulation, students may also be able to collect, graph, and analyze data to draw conclusions of their own. 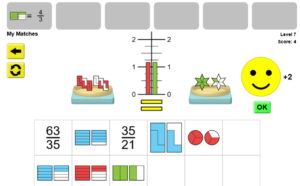 PhET simulations are especially useful for creating visual representations of hard to grasp concepts in science and math while making them engaging through student manipulation. 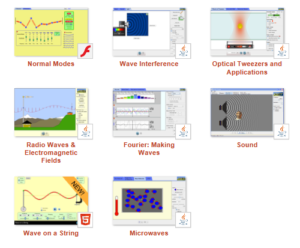 PhET simulations are easy to access and free to use by anyone with a device and an Internet connection. There is no account or login required for use, but with a free account, teachers can also have access to teacher-submitted activities and primer videos. Overall, this is a great resource for making STEM concepts come alive! Depending on the simulation you run, you may need to install Java. There is a lot of help specific to your device under the Help Center tab at the bottom of the page. It is strongly recommended that you either plan time into your lesson to allow for setup or have students do so the night before otherwise a lot of time will be lost to tech support rather than learning. Ease of Use: Teachers can browse for videos very easily, by selecting subject area, grade level, and or language. There is a tips section for teachers and the Help Center is incredibly useful. The simulations are very intuitive and require little to no explanation prior to letting students loose to explore concepts in science and mathematics. Because some of these PhET simulations are older, there might be some difficulty with the initial setup, which may involve installing Java and ensuring your students’ devices are compatible with the particular simulation you have chosen. Accessibility & Equity: While they are working on adding accessibility features to all of their simulations, many of them have options for keyboard navigation, auditory descriptions and feedback, as well as sonification which is non-speech sound used to convey information like the strength of a magnet. Check out this link for more information. Another thing that is really great is that many of their simulations have been translated into other languages. They have at least 1 simulation translated into 87 languages. These simulations allow students and teachers who do not have access to fancy lab equipment to still study and learn about concepts through the scientific method! Privacy: There is no login required, no account, it is just a program that students run on their device as a result their data is neither collected nor shared. Substitution: Students use a simulation to watch a particular process take place rather than looking at diagrams or videos. Augmentation: Students engage with the simulation and are able to manipulate it, adding interest to the activity. Modification: Students use a simulation to observe, test, and gather data in order to develop an understanding of a particular concept that they then share with the class. This fuels inquiry based learning. Redefinition: Students are able to use simulations to observe, manipulate and understand otherwise unobservable phenomena like molecular structures, membrane permeability, or the photoelectric effect. Math: Help students to better understand fractions and become more comfortable using them in mathematical operations by building, matching and manipulating them. 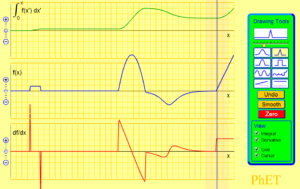 Have calculus students determine the derivative or integral of certain graphic representations by manipulating graphs. Science: Conduct a simulative field study on evolution and natural selection. Determine the properties of waves through investigation. Observe molecular movements across a membrane or in a neuron. Observe and interact with molecules and atoms up close to better understand the inner workings of matter. Or have students experiment with the photon absorption rates of different molecules and observe the greenhouse effect. If you have trouble getting the simulation to run, go to the help center where you will find answers to many of your questions, if not, contact the PhET. Wieman, C. E., Adams, W. K., Loeblein, P., & Perkins, K. K. (2010). Teaching physics using PhET simulations. The Physics Teacher, 48(4), 225-227. Adams, W. K. (2010). Student engagement and learning with PhET interactive simulations. Il Nuovo Cimento C, 33(3), 21-32. Adams, W. K., Paulson, A., Wieman, C. E., Henderson, C., Sabella, M., & Hsu, L. (2008, October). What levels of guidance promote engaged exploration with interactive simulations?. In AIP Conference Proceedings (Vol. 1064, No. 1, p. 59).